The all-new Mercedes E Class made its global debut last year, however the car is yet to make its debut in the Indian market. Sources close to us informed us that the launch is expected to take place around March this year. If you are looking at getting the current E Class, you can get some great deals. The all-new Mercedes E Class borrows its exterior and interior styling from the other sedans of Mercedes Benz. While the front looks end has similar styling to the C and S, The E gets dual LED strips on the headlamps as opposed to the single ones on the other two vehicles. The rear though is a different story with the C, E and S looking very similar, just varying in lengths. On the inside too, the E borrows the digital instrument cluster from the S class and follows the same styling. Now for the interesting bit though. While Mercedes has LWB (Long Wheel Base) versions of its sedans in the Chinese market, we have only gotten the S Class LWB. This time around, we will be getting the E Class in LWB format which means you can expect acres of room at the back. In the new LWB format, the E Class has a wheelbase of 3079 mm and a length of 5063 mm, making it a cool 140 mm longer than the normal E Class. While the highlight of the new E Class was to be the all-new 2.0 liter diesel engine, India will have to wait for that till 2020 due to fuel quality issues and current emission norms. Two engine options are expected to come with the new E Class initially, a petrol one and a diesel one. 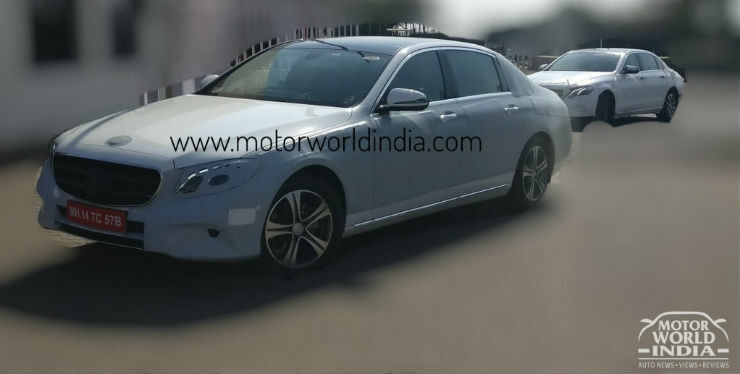 The petrol one will be the E200, which borrows the same 2.0 liter engine from the C200 and produces 184 Bhp while the diesel version will be the E350d which will feature a 3.0 liter V6 that produces 258 Bhp. It will be interesting to see if Mercedes brings in the 300 engine range in the E Class too, since the GLC is already running the same tune. As for prices, expect the new E to be priced considerably higher than the outgoing version. We expect pricing around the Rs 65-70 lakh mark, given that this is the LWB variant that they are bringing in.